Today was a quiet day getting prepared for the rendezvous events. We stuffed bags with brochures and give-aways. 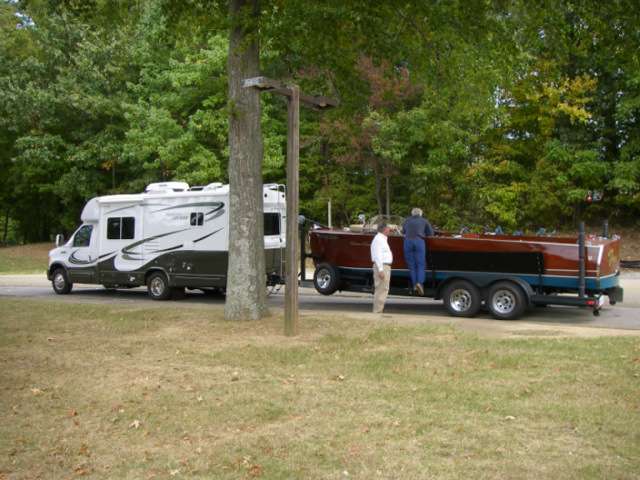 Our friends Bob and Gail came through on their way home from a Antique and Classic Boat Society event at Pickwick trailing their Chris Craft behind their new RV (see photo). Bob returned the keys we had lost at Gold Point. He also came to see the Harbor Master Coastal Cruiser his company had sold to a live aboard looper from Texas. Harbor Master is one of the sponsors of the rendezvous. An impromptu pot luck supper was organized beside the pool tonight and we had a chance to meet some new people and revisit with folks we met on the loop and at previous rendezvous.